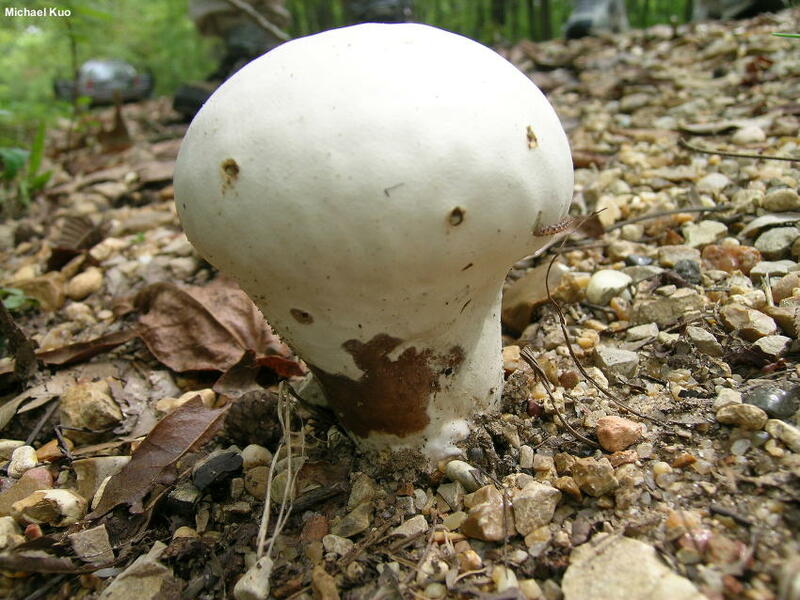 Fairly common in grassy areas along the edges of roads, in ditches, and in urban areas across much of North America, Calvatia craniiformis is a medium-sized to large puffball that often develops a distinctive, skull-like shape as it develops (hence the epithet "craniiformis"). The skull shape is reminiscent of an inverted pear, and results from the well-developed "sterile base" underneath the spore case. 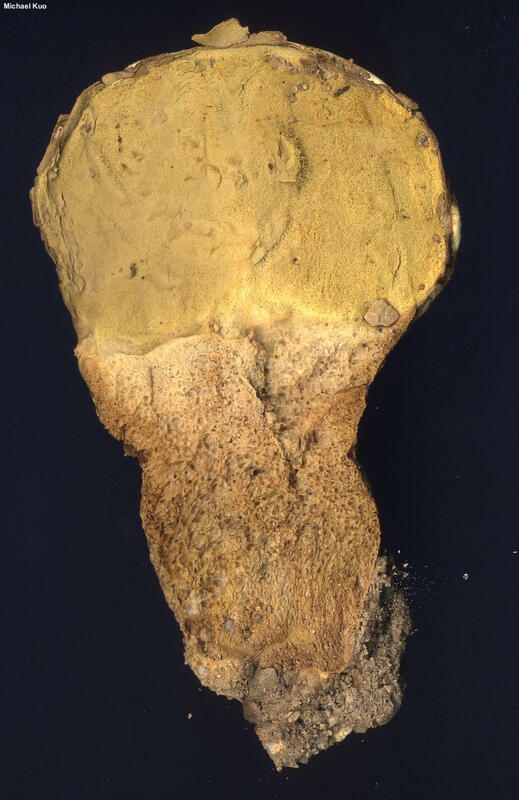 When sliced open, Calvatia craniiformis has flesh that is initially white but changes color to olive yellow as it matures and becomes spore dust. Calvatia cyathiformis is similar, and inhabits similar settings, but can be separated by its tendency to develop mosaic-like scales or patches and, more definitively, its purple mature flesh and spore dust. Ecology: Saprobic; growing alone or gregariously in grassy areas—including urban settings like lawns and roadsides, but also at the edges of woods, in ditches, and in waste places; summer and fall; widely distributed and common from the northeastern United States to the Rocky Mountains and the Southwest--but virtually absent west of the Rockies. The illustrated and described collection is from Missouri. Fruiting Body: 5–15 cm tall; 5–10 cm across (but also reported up to about twice this size); ball-shaped when young but soon developing a sterile base and becoming shaped like an inverted pear or a skull. Outer Surface: Whitish to pale brownish; bald; bruising brownish where handled; the skin about 1 mm thick. Interior: White and firm when young; soon becoming two-chambered texturally, with the basal portion distinct from the upper portion; upper portion becoming yellowish and finally olive brown as it matures and turns to spore dust; basal portion turning yellowish, then olive as it matures. 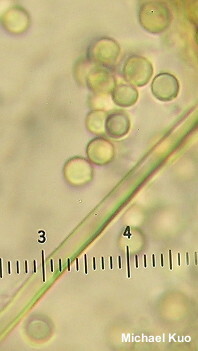 Over-Mature Specimens: After the top ruptures and the spore mass is dispersed, the sterile base can remain, cup-like, with a ragged upper edge, for weeks. Microscopic Features: Spores 2.5–3 µm; globose or subglobose; nearly smooth; with or without a short pedicel; olive yellow in KOH; inamyloid. Capillitial threads 2–4 µm wide; smooth; thick-walled; occasionally septate and then slightly swollen on either side of the septum; olive in KOH. REFERENCES: (Schweinitz, 1832) Fries, 1849. (Saccardo, 1888; Coker & Couch, 1928; Smith, 1951; Zeller & Smith, 1964; Smith, Smith & Weber, 1981; Weber & Smith, 1980; Lincoff, 1992; Horn, Kay & Abel, 1993; Miller & Miller, 2006; Kuo & Methven, 2014.) Herb. Kuo 09240507.